With the presence of a large pool of participants, the global hemophilia treatment drugs market is displaying a highly competitive business landscape, finds a new research report by Zion Market Research (ZMR). Shire Plc, Novo Nordisk A/S, Pfizer, Bayer AG, CSL Limited, and Biogen are some of the key vendors of hemophilia treatment drugs across the world. These players across hemophilia treatment drugs market are focusing aggressively on innovation, as well as on including advanced technologies in their existing products. Over the coming years, they are also expected to take up partnerships and mergers and acquisitions as their key strategy for business development, states the hemophilia treatment drugs market study. Citing an instance, in September 2018, Bayer AG’s hemophilia A drug therapy for rare kind of genetic disease received accolades and recommendation by European Medicines Agency panel. In yet another instance, in October 2018, Genentech Incorporation – a biotech firm and a subsidiary of Roche Group- declared FDA’s approval of its Hemlibra ® for treating routine prophylaxis for preventing bleeding in adults & children, new born, and elderly people with hemophilia A without factor VIII inhibitors. As estimated in this report, the global hemophilia treatment drugs market stood at US$ 17.37 billion in 2017. 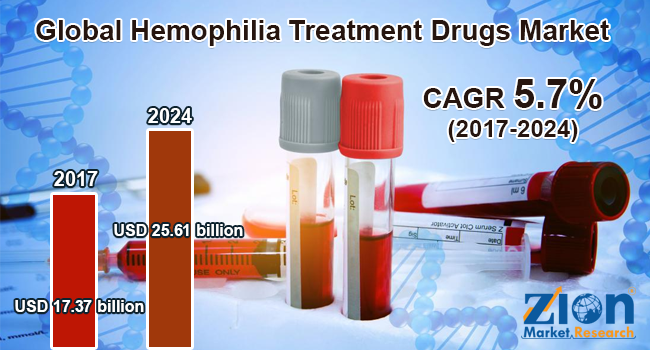 Witnessing a tremendous rise during the period from 2017 to 2024, the revenue in this hemophilia treatment drugs market is expected to reach US$ 25.61 billion by the end of the forecast period. The main products available in this hemophilia treatment drugs market are recombinant coagulation factor concentrates, plasma derived coagulation factor concentrates, desmopressin, and antifibrinolytic agents. Among them, the demand for recombinant coagulation factor concentrates is relatively higher and the trend is anticipated to remain so over the next few years, notes the research report. “Extensive need for diagnosis of target population for initiating prophylaxis therapy along with favorable government schemes are predicted to lucratively influence the expansion of hemophilia treatment drugs market in the near future,” says the author of this hemophilia treatment drugs market study. Apart from this, rapid increase in the neo-natal population leading to immense rise in the diagnostic rate is projected to boost hemophilia treatment drugs market trends. Regionally, North America has been leading the worldwide hemophilia treatment drugs market and is anticipated to continue on the dominant position in the years to come, states the hemophilia treatment drugs market study. Prominent awareness about hemophilia along with introduction of new technologies for treating hemophilia is the key factor behind the dominance of the North America hemophilia treatment drugs market. The high number of market players being headquartered in North America is another significant factor that is supporting this regional hemophilia treatment drugs market.